When Tom Winters saw a for-sale sign on the wall of what is now Adobe Rose, it felt like it was meant to be. The building came complete with the sort of charm befitting a bed and breakfast and fine-dining establishment. Constructed in the late 1960s by art students at the College of Artesia – then located directly across 13th Street, where the Federal Law Enforcement Training Center (FLETC) stands today – the studio had been partially funded by a generous donation of works for auction by New Mexico artist Peter Hurd. In appreciation, the college dubbed the building the Peter Hurd Gallery. Its proximity to the FLETC also appealed to Winters. Winters learned his nephew, Chad Harcrow, was also interested in the building. “He made the investment in the property and I made the investment in the restaurant, and it worked perfectly,” Winters said. 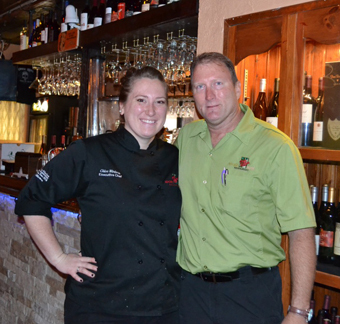 Adobe Rose Restaurant opened its doors in November 2012 with Winters’ daughter, Chloe, a graduate of the Culinary Institute of America in Hyde Park, N.Y., as head chef. If the Winters had any qualms about how a gourmet eatery would be received amongst a “meat and potatoes” population of 11,000, they were soon allayed. 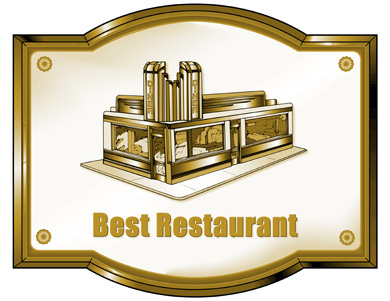 Adobe Rose has grown steadily in popularity and was chosen as Best Restaurant by a wide margin in this year’s Best of Artesia contest. 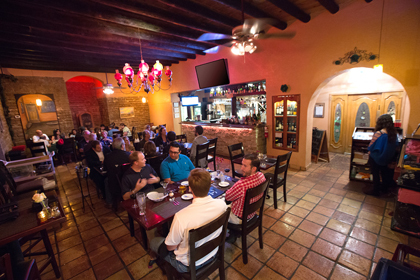 A perfect mixture of delicious, well-prepared food, elegant ambiance, and a friendly and accommodating staff greet diners at Adobe Rose, who have found overwhelming favorites on the menu while still enjoying its seasonal alterations. Patrons can find familiar regional appetizers taken to the next level, such as chips and queso and jalapeno poppers, and current menu entrees include ancho-rubbed chicken fried chicken, roasted chile chili, 14 Hands cabernet pot roast, apple bourbon pork chops, and grilled beer caramel glazed quail. Chloe has garnered significant recognition for her efforts in a short amount of time, including the 2014 New Mexico Restaurant Association’s Chef of the Year award. She credits her staff and her love of preparing food for her success. While the food is enough of a draw on its own, Adobe Rose also strives to ensure its customers are enjoying themselves, offering theme nights and specials that pack in the crowds. On a busy Friday night, Tom says, the restaurant can see between 350 and 450 diners come through, though weeknights are also active due to specials. Adobe Rose frequently welcomes musicians to its patio area on weekends until the weather becomes too chilly and also hosts occasional theme parties, such as ‘70s Night, ‘80s Night, and – most recently – Halloween festivities. “One thing you can always count on us for is being out of the ordinary, out of the box,” Tom said. This month, the restaurant will be hosting its annual Thanksgiving Day meal. “It’s a set menu, but of course it’s a turkey and ham spread,” Tom said. “It’s been very popular. We’re full on Thanksgiving. The Winters say they’re proud to have earned the title of Artesia’s favorite eatery and plan to continue working to provide the community with a quality dining destination. “We’re just happy to be Artesia’s restaurant,” Tom said. “Everyone seems to be so receptive to what we do, and we appreciate that. We’re very appreciative of what the community has done for us, and of course, we’re hometown people, too.